Click the PLAY button to hear Jacqueline talk about listening to bees. I’ve been stewarding bees since 2004. 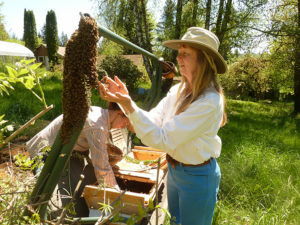 I got a few hives, joined my local bee club and went to bee school. Right from the start I was sure what I was learning was wrong. I was told to put chemicals on my bees and I just couldn’t do that. I lost my first few hives. Even trying to do “clean organic beekeeping”, I made plenty of mistakes. It was hard to find the information I wanted to know. I did lots of reading, joined internet groups and I kept watching my bees, wondering how to access their inner world. In 2008 I started to make headway. I became able to see subtleties in their behavior and to grasp larger lessons about the hives themselves. I believe the bees began to teach me what they wanted me to know. I learned to be quiet and listen. I would sit near my hives and watch them for an hour or more, asking how to care for them in the way they most would flourish. I took photos, I recorded their sounds, I wrote about them in my journal and I painted bee images. But mostly I watched and I noticed what I felt in their presence. And so I became a part of bee life. When I opened myself to the bees, I began to see images in my mind that I wrote down as clearly as I could, and when I read those answers I was awed. This was not information I had ever read or known. It was as if the bees began to talk … and I listened. I asked questions of the bees and I began to hear them, to understand them, in a much bigger way. Most people believe the role of the honeybee is to pollinate crops and make honey for humans to eat. Bees keep a little, we get the rest. Nearly all bees that are kept by humans are pigeon-holed into those roles and treated kind of like chattel, like indentured servants whose mission is to serve our needs. Here I speak about treating bees with respect and gratitude, which is what bees are all about. I want to open you to the many profound ways that honeybees offer their work to propel mankind’s spiritual evolution. Their respectful industry and fellowship are living examples of love, interdependent communities, and an ever outflowing story of creation. Some of what I speak about is from direct observations of the hive, but much of it is communications from the bees themselves that came to me when I asked so earnestly. What I’ve learned at their wings is a most profound education.